A lightning rod or lightning conductor is an iron rod that is used to make lightning strike it, rather than strike something else. It is part of a lightning protection system. Such a system is made of many such rods. These rods are usually placed at high points of buildings and structures. In addition, paths are made the electricity can take from the rooftop to the ground, it was made in the year 1749 later improved in 1752. Lightning can damage structures made of most materials (masonry, wood, concrete and even steel). The huge currents involved can heat materials, and especially water to high temperatures. This will cause fire, loss of strength and explosions from superheated steam and air. "temper the destruction of hail and cyclones and the force of tempests and lightning; check hostile thunders and great winds; and cast down the spirits of storms and the powers of the air." Peter Ahlwardts ("Reasonable and Theological Considerations about Thunder and Lightning", 1745) said people who sought to protect themselves from lightning should go anywhere except in or around a church. In Europe, the lightning rod was invented by a theologian and natural scientist, Václav Prokop Diviš, between 1750 and 1754. He is the inventor of the first grounded lightning rod, which he erected on 15 July 1754 in the garden of his home in Přímětice u Znojma. It consisted of 400 sharp metal spikes attached at the top of a 42 m tall supporting pylon. The structure was fastened by three metal chains, conductively attached to the iron grounding cones buried in the packed down soil. He described his 'weather machine' in the treatise 'Descriptio machinae meteorologicae'. The original idea was to continually sap the electricity out of the clouds and so actually prevent the lightning and the storms, only in case this failed, the machine should have also been able to directly attract the lighting and channel it to the ground. He proposed his machine to be used on church towers and ships. He was sending his observations regarding the machine operation to Jan Antonín Scrinci, the physics professor at the Charles University in Prague, who published them in 'Prager Postzeitungen', 'Brünner Intelligenz-Zettel' and in 'Stuttgartisches Journal'. The machine is also mentioned by Leonhard Euler in 'Lettres à une Princesse d' Allemagne'. In 1755 Diviš asked the Emperor Ferdinand I of Austria to let him build more machines on several places for the welfare of the people. The emperor let the mathematicians in Vienna judge the proposal, but they refused it. Abbé Marci, court mathematician and Diviš' friend commented: 'Blasphemant, quae ignorant' (condemning what they do not know). In 1756 the machine was damaged by wind and then rebuilt, and then on 10 March 1760, angry villagers of Přímětice tore down the structure, blaming Diviš for drought which struck the region that year. Later in the year, after the summer during which the thunderstorms did a lot of damage to the fields and vineyards, the people besought him to rebuild the machine, which he did in the precinct of Loucky monastery, and built another one on the top of the church tower in Přímětice. "The electrical fire would, I think, be drawn out of a cloud silently, before it could come near enough to strike [...]." Franklin speculated about lightning rods for several years before his reported kite experiment. This experiment, in fact, took place because he was tired of waiting for Christ Church in Philadelphia to be completed so he could place a lightning rod on top of it. There was some resistance from churches who felt that it was defying divine will to install these rods. Franklin countered that there is no religious objection to roofs on buildings to resist precipitation, so lightning, which he proved to be simply a giant electrical spark, should be no different. As an act of philanthropy, Franklin decided against patenting the invention. 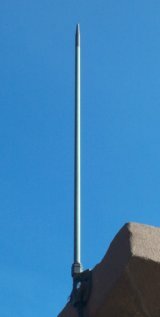 In the 19th century the lightning rod became a symbol of American ingenuity and a decorative motif. Lightning rods were often embellished with ornamental glass balls (now prized by collectors). The ornamental appeal of these glass balls has also been incorporated into weather vanes. Balls of solid glass occasionally were used in a method thought to prevent lightning strikes to ships. It is worth noting here not because it worked, which it did not, but because it reveals a lot about pre-scientific thought. Glass objects do not conduct electricity well. They are seldom struck by lightning. Therefore, goes the theory, there must be something about glass that repels lightning. Hence the best method for preventing a lightning strike to a wooden ship was to bury a small solid glass ball in the tip of the highest mast. The random behavior of lightning ensured that the method gained a good bit of credence even after the development of the marine lightning rod soon after Franklin's initial work. Nikola Tesla's U.S. Patent 1,266,175 was an improvement in lightning protectors. The patent was granted due to a fault in Franklin's original theory of operation; the pointed lightning rod actually ionizes the air around itself. This makes the air conductive, which in turn raises the probability of a strike. Many years after receiving his patent, in 1919 Dr. Tesla wrote an article for The Electrical Experimenter entitled "Famous Scientific Illusions", in which he explains the logic of Franklin's pointed lightning rod and discloses his improved method and apparatus. ↑ Seckel, Al, and John Edwards, "Franklin's Unholy Lightning Rod". 1984. This page was last changed on 3 April 2018, at 17:29.